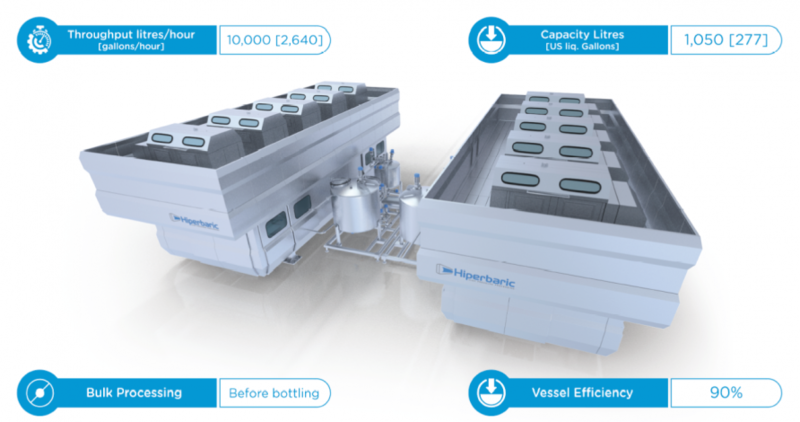 The Hiperbaric 1050 Bulk is a global innovation for large productions of HPP beverages. This is a unique equipment based on a revolutionary concept (patent pending), in which beverages will be processed in bulk (before bottling). It delivers 10,000 l/h [2,640 gal/h], which is the world largest productivity, associated with the lowest processing cost and minimum energy consumption. The Hiperbaric 1050 Bulk will fit perfectly into any large beverages production line and will allow the use of any kind of packaging after HPP, no matter the material, design or size. Hiperbaric 1050 Bulk allows processing beverages in bulk before bottling. With the new equipment, the process will be simpler, with less stages and with a higher productivity. Its design is based on two vessels of a Hiperbaric 525 machine, together with a system of tanks where beverage is stored before and after the HPP process.